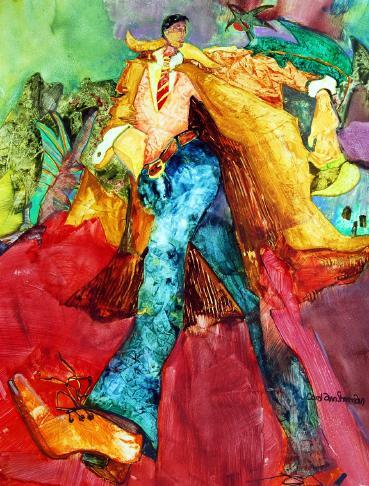 Carol Ann Sherman is an artist from South Florida who teaches watercolor on Yupo, traditional watercolor, batik on rice paper and drawing. Her work is characterized by strong compositions, bold line quality, and a vibrant layering of color on color and tone on tone. For this workshop, Carol Ann will be working with Watercolor & Yupo Paper! The bright white, slick surface of the paper creates an interesting effect with translucent watercolors. Because the paper is waterproof, water evaporates into the air instead of soaking into the paper. The pigments do not soak in either, but sit on top of the paper. Colors pop on the bright white surface. Watercolor paints move easily on the smooth, slick surface and interesting textures form as the water evaporates. Because the color sits on top of the surface you can easily wipe away unwanted sections of your painting and start again with a fresh surface. Unlike traditional watercolor paper, YUPO paper requires no soaking, stretching, or taping flat!